Home / Uncategorized / Will tobacco be banned in MLB Baseball???! Will tobacco be banned in MLB Baseball???! 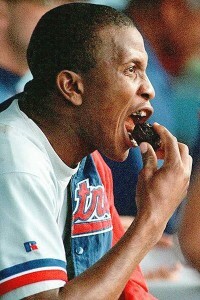 Since almost the beginning, smokeless tobacco has embedded itself into the allure of baseball. Baseball’s chewing collage dates back to the very roots of this national’s past time. The term “bullpen” was derived from Bull Durham tobacco, which was first produced by the Blackwell Tobacco Co. in 1860. During what has forced people to view baseball as an ever changing and evolving game after the integration and then divorcing of performance enhancing drugs, inter-league play, and instant reply, it seems as though Bud Selig very well may implement another controversial policy. The banning of smokeless tobacco. Personally, despite what most of you may think. I believe it will be only a matter of time. Not a lot of people know this but tobacco use is actually against regulation in the minor leagues. What I do know is that tobacco is highly addictive, extremely bad for your oral health, and causes cancer. Throughout my career I have had countless teammates use smokeless tobacco and were addicted, and I would always think….”what’s the purpose”, and could never come up with an answer.